You see signs like this from January to early February and from July to early August, and your consumer spirit begins to stir. 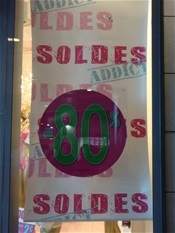 Unlike in the United States where there are bargains at every Hallmark card holiday, the sale season in France occurs only twice a year. When they do, there are bargains galore from clothes and linens to building materials and appliances. And every week during that sale period, the prices tend decline even more. Sometimes up to 80% off when you consider the final markdowns and the across the board percent cut on all purchases. It’s enough to revive the American shopper in me. But instead of encountering crowds of people elbowing each other as in Macy’s or Old Navy, the people in this part of France are careful, focused shoppers. Price markdowns are not sufficient drivers for expenditures. Need, functionality, and maybe, even investment in some future, anticipated want are reasons to search and pay for goods. Quality not quantity rules the day. It’s a lesson that I have begun to adopt because of space constraints in the current household. It’s also a skill that I admire because I have been desperately trying to practice it over the last few years as well as instill my children with the philosophy. I have a long way to go. For instance, this weekend, we were at the Bezier mall to shop for a birthday party that second daughter will be attending. Since it was the last weekend of the sale season, the signs were practically in every store. We couldn’t resist checking one or two since first daughter had some Euros from her father that, she believed, had to be used. We did come upon some very lovely blouses that were not only attractive but functional. Also, so very French in style and appearance. First daughter bought two different blouses and I selected one from a sales rack that had several colors of the same style. Upon purchasing, the price was much lower than expected. The sales lady explained that everything in the store was an additional 10% off because of the last days of the sale. As we walked out to a café for sandwiches, I murmured to first daughter that I should have bought one in every color. That mindset continued until we arrived home. “Mom, why didn’t you?” first daughter finally said. “I don’t need one in every color although the style looked good on me,” I replied. “You should have bought them. You’ll be blaming us for not making you do it,” she concluded. Last July, we had a visiting friend that we took to Narbonne for some sightseeing and lunch. We ended up spending more time shopping because the sales were ubiquitous. And when we tested a few retail stores, we were simply amazed at the quality and the marked down prices. But the shopping strategy was different from our normal practice. This is not simply pulling things off the rack hoping that the size will fit but many minutes spent in the dressing room trying out items and seeking opinions. Sometimes even acknowledging other shoppers’ approval looks or comments. It’s like everyone in the shop is interested in making sure you select the right item that will hang perfectly on your body’s shape. No judging, no hard sell, and no pressure to grab the item before someone else does. Perhaps this more refined, attentive approach can be result of the environment in which one shops. When one enters a retail store or boutique, one is greeted right away as a valued client or client to be. There is the usual exchange of “bonjour” as it is considered rude to walk in without acknowledging the sales people. It’s like walking into someone’s house without greeting the host. Then, as one looks through the racks and shelves, one is approached by sales staff offering help. If not needed, they stand on the side but always conscious if assistance is required for carrying items or looking for sizes. The store layout is easy to navigate and sales staff are quick to pick items off the floor or put order into shelves and racks. And even when one leaves without purchasing anything, they say goodbye and thank you with a smile. Maybe this type of civility happens only in this part of France. But I have had this experience in Paris and Aix en Provence. (Of course, by store, I mean retail merchandise outlets not groceries or those large big box stores that sell hardware or appliances). In Virginia, I have walked into Ann Taylor, Chico’s, Banana Republic and similar retail stores but have not felt the same hospitable atmosphere. It is simply commerce. And while it may be commerce in France as well, there’s an added layer of etiquette that makes shopping enjoyable. It is less of a transaction and more like a treasure hunt.